The difference in elevation between adjacent contours. The distance between two consecutive contours on a map. 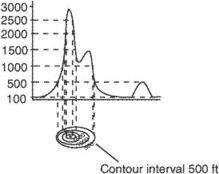 The contour interval on a map is constant. The determining factors are the steepness of the slopes and the contour interval that will be used. This would result in a theoretical contour interval of 0,4' for accuracy and C-FACTOR calculation purposes. 50 m Contour interval taking grid 50Eu50 m between LUV-KUSH Ganga Barrage Kanpur and Lucknow - Kanpur Rly line and cross vise between 50 m Left side of L.
Open Competition: Performing engineering research 12 scale 000 for the development of land use planning documents (aerial photographic work with the creation of digital orthophotos, scale 12 000 and a digital topographic base, scale 12 000 with a contour interval of 1. The assignment is to make up a land formation with the guidelines to include the following requirements: at least one railroad, show contour intervals, label all contour lines, show rivers, show the five map symbols with the use of the map key, indicate the hills, depressions and the direction rose. 5 m wide unplowed strips were left at contour intervals based on a 1. He is explaining the route to the pictograph panel, getting caught in the contour intervals. After seeding, the field was ripped at contour intervals of about 8 m (26. Topographic mapping of all pipeline routes at a scale of 1 =30 with 2-foot contour intervals based on aerial photography and preliminary water main alignment. Preparation of the Contour Plan at suitable contour intervals, depending upon the topography of the terrain and preparing drawing in A-l size, recording reduced level at 5.